I know today is Christmas, but I wish you a happy whichever holiday you celebrate this time of year. I’ve been waiting for this time of year to come because there’s one book I really really wanted to blog about! I was traveling to visit family and didn’t get a chance to write this post before I left, so I apologize if it’s a little late. Festivus. Anyone who knows me knows that I’m a HUGE “Seinfeld” fan (I watch the repeats three times per day. My favorite episode is “The Chicken Roaster“.). Each year on December 23rd, I look forward to watching the episode “The Strike” (even though they didn’t show it last year!). One of the storylines in this episode is about a holiday called Festivus that George’s father made up when George was a boy after getting into a fight over a doll that he was trying to buy for George for Christmas. He decided to rebel against tradition and start his own holiday, “a Festivus for the rest of us!” It involves an aluminum pole instead of a tree (“I find tinsel distracting.”); the “airing of grievances” to your family, telling them all the ways they’ve disappointed you in the past year; and the “feats of strength”, where a chosen family member wrestles the head of household in an attempt to pin him/her. 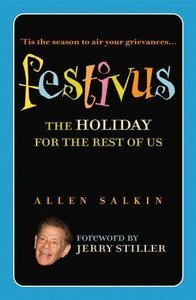 Last holiday season near Festivus, I discovered that there was actually a book called “Festivus: A Holiday for the Rest of Us” by Allen Salkin. I had to order it right away. Basically, the book explains where Festivus actually came from (spoiler alert: it wasn’t made up just for “Seinfeld”!) and how to properly carry on a Festivus celebration. The book is quite funny and gives examples of real Festivus celebrations. If I had more friends that were huge “Seinfeld” fanatics like me, maybe I’d start my own yearly Festivus celebration. It’s a lighthearted look at the anti-holiday made famous by the show and you learn some interesting tidbits along the way. There were some additional Festivus traditions that I was not aware of that the book details as well. Oh – and for your holiday gift, I made a donation on behalf of my readers to the Human Fund. You’re welcome.